One of the things Cari and I want to change at school this year are the fundraisers. The kids are always selling one thing or another, and it is never anything anyone wants. Wrapping paper? Magazines? Frozen pizza? No! One of the first fundraisers every year is what they call “spirit wear”, which is just t-shirts and sweats. In the past they have always used a generic Rumsfeld Tigers logo and it is so boring. 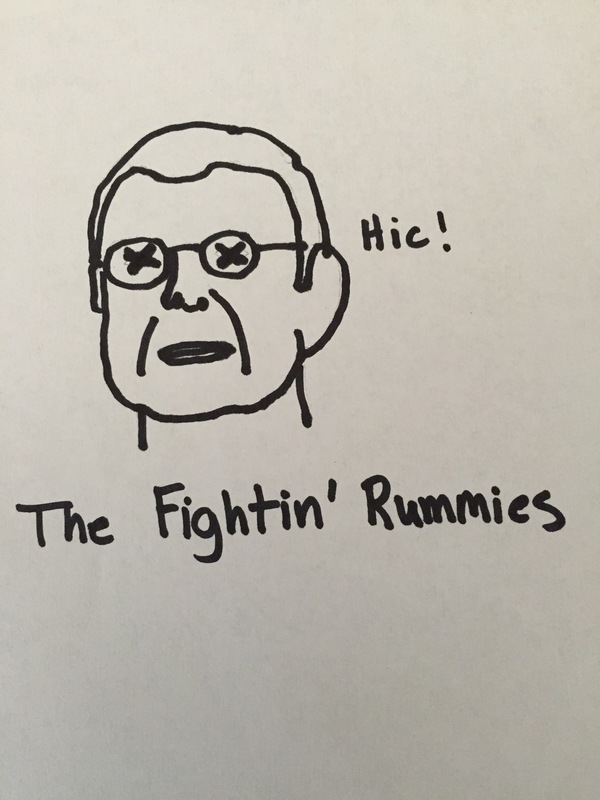 I have suggested over and over that we change our mascot to “The Fighting Rummies” and everyone always says that is too controversial because “rummies” is an outdated term for alcoholics. Okay, what is the problem? I say we embrace it! So, since I am in charge of ordering the shirts this year I am going to to put the fun back in fundraising. Obvs i can’t ask anyone at school to help with this because they will give me a hard time, but I have sketched up two different logos for the shirts. Which one do you think would be a better representation of our sweet little school? I think this is cute with Donald Rumsfeld holding an old-timey jug of hooch. Obviously it is just a rough draft, but I think it is fun! In this one Donald Rumsfeld appears to be blotto. LOL! So what do you think? I know i have my favorite, but I’d love some unbiased opinions. Thanks! 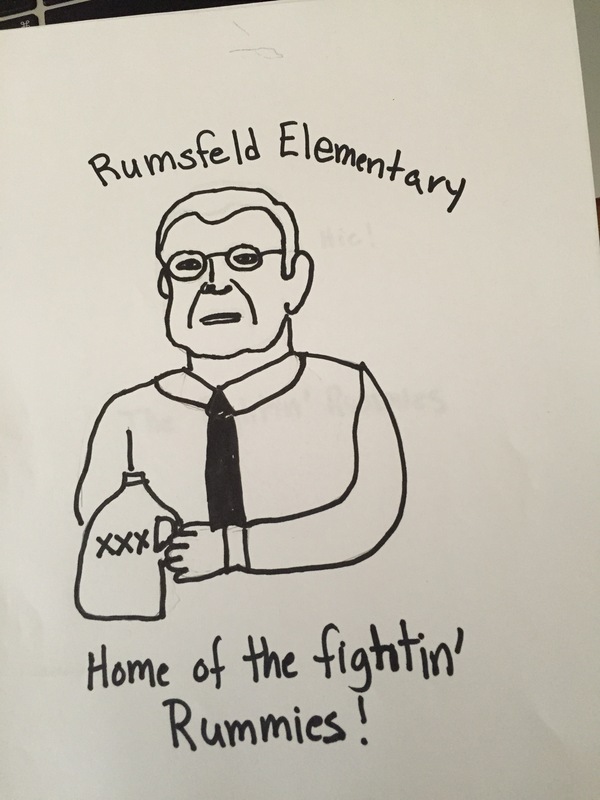 This entry was posted in School and tagged Donald Rumsfeld, fundraisers, rummies, t-shirts on August 26, 2015 by mythreeangles. Add a Moonshine Still to the background of the second one and you have the added benefit of history. Moonshine stills were part of the old timey American culture! There’s even a show about it. With the fuddy duddies you have to deal with, I think adding a piece of history will shut them up. Great idea, Rose. Are the stills the things with pretty curly cue tubing? Exactly!! And some are copper, very classy. I like the first one better because strangers might read the shirt and say “hic” to your children while wearing there shirts and it would just crush poor Starling to be called a “hick”. She’s not a hick, even if she does like to go camping sometimes she is not from the country or anything like that. Maybe I could change it to something like, “I luff yew tho much, man,” to show his white boy roots? “come on back to the frat house, you can sleep it off in my bed” is more white. Great thinking, Cindy. I think that phrase is something all Republican wives can relate to. What about the fighting fields! You could do all sorts of patriotic battle sites. Dead enemies would be much more inspirational that some drunk. How is anyone supposed to know that’s Donald Rumsfeld? It’s really just a generic dude with a shirt and tie. Holding a moonshine jug? Come on, we all know what suits get drunk on and it doesn’t come out of a dirty moonshine jug. I think you should have a banner in the background that says “IRAQ WAR GOING WELL, THANKS” so we all know it’s no other than ol’Donnie. I think I have been to enough Republican fundraisers to know those old boys will drink anything you hand them. And the jug is cute. Also, Donald is a generic white guy. You can tell it’s him by the round glasses. Donald Rumsfield is totes cute (lil’ oldmancrush here). You should use a real pic of him on the shirts. And your fundraiser should be an open bar. You could put cute umbrellas in the drinks that have the school colors on them, and invite the faculty (I hear the ol’ principal is quite the lush). Have the student council serve the drinks; it could be a cross-curricular project with math and science and other school stuff. I bet there’s a common core standard for that! We should do it every Friday on the playground at pick up time. We could give it a cute name like TGIF Club and everyone could wear their cutest clothes and we could have a cocktail of the week. I’ll run it by the principal later! Fun! I’m so confused. You are going to wear a t shirt with a logo? And let Starling do it, too? No. I am going to sell them, not wear them. Try to follow along, Suzy. I like the first picture better, but the second will probably make a better tshirt. Either way the school is #soblessed to have you working on this! Such clever ideas! I am always full iof great ideas.